No time like the present. - I bet you think this blog is about you. Or six months later. Or eight. Whatever. You may recall I went to Seattle in April, though I was in a posting drought and didn't give a full recap of the trip. 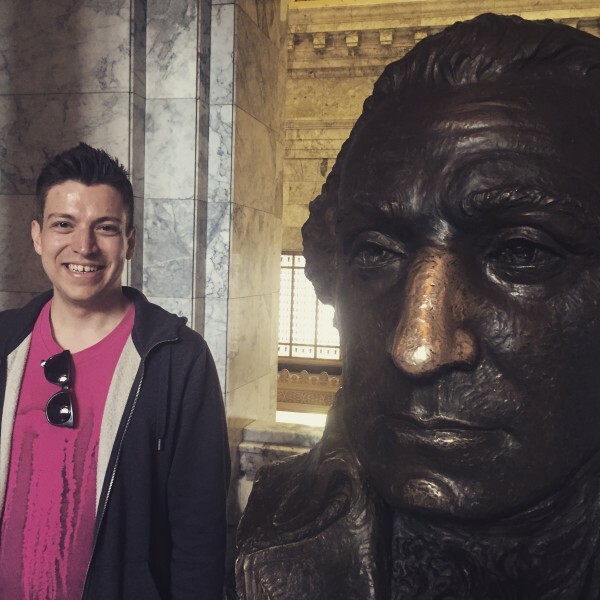 Anyhow, Brian and I used the last day of the trip to rent a car and visit the Washington State Capitol in Olympia. It was a lovely day trip, and pretty convenient because Hertz had a pickup point in the basement garage of our Seattle hotel. I partook, we drove up there*, toured the Capitol, then came back and the next morning dropped the car at the airport. Why am I telling you this? Because upon arriving at Sea Tac, the rental car people found a scuff on the front bumper and pinned it on me since it hadn't been noted when I picked up the car. So upon my return to DC I called the (lovely) people at American Express and they opened a claim for me as I cover all rental car reservations with that card. Hertz continued to be super non-responsive throughout the summer and fall when asked by Amex for documentation, and I learned to navigate the Amex phone tree very well as I periodically checked for a status. Just today, while at work, I was notified that Hertz finally coughed up their side of the story, got paid a princely $127.00, and the claim was resolved. Better that the lovely Amex agents in some office in Cleveland had to hunt that down than me. Since I failed to blog about it at that time: me hanging out with George in Olympia. And continuing in that vein, you may have heard that hackers gained access to the database containing personally identifiable information** for everyone that had had a federal background check since I don't know when. All I know is the breach included all the information I surrendered for my EPA background check in September 2011. At last, on Monday, I received the official mail notification that I had been impacted (duh) and how to gain access to free credit/identity monitoring. Better way late than never? Back where people are good at life, I cleaned up the house earlier tonight while B got the stuffing and mac & cheese prepped. The turkey is still in its brine bath, and tomorrow we just have to bake everything and assemble mashed potatoes, gravy, and green beans. Guests are coming at 2, with dinner served at 5. *And stopped in a Church's Chicken drive-thru on the way up. There were so many fried chicken spots on our route that B exclaimed "Their chicken game is ferocious!" I almost but didn't crash the car at that moment. **For my part that included basic demographic info with my SSN, family member names, prior employment and education, and all ten fingerprints. Joy. I'm glad the issue with Hertz was resolved in your favor, and that it wasn't a big hassle for you. I had heard about the data breach, but I didn't realize it included all of the info you listed. Good luck - hope nothing happens to your identity. Basically the data breach was of the OPM Central Personnel File, and as much data was exposed as was collected for each person. Since my contract position required me to work in a federal building, they collected fingerprints and all that jazz.